A quality gliding rowing machine can be a great way to improve your endurance, strength, cardiovascular health, and muscle tone. Below, we will take an in-depth look at the very popular Stamina Body Trac Glider 1050 model. 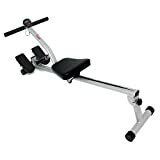 This rowing machine can serve multiple workout functions and has received good consumer reviews on multiple platforms. Our objective is to help you understand all of its features, specifications, routine uses, and overall design elements. 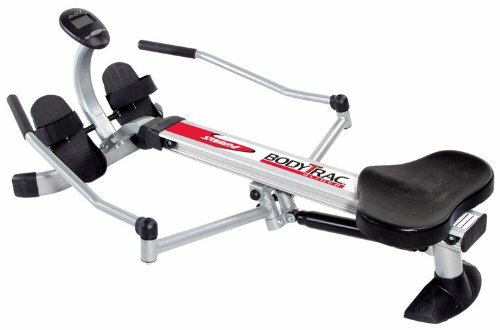 It the end, you’ll know if the Stamina Body Trac Glider 1050 is truly the best rowing machine for you. 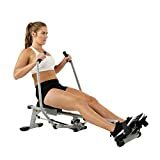 The Stamina Body Trac Glider 1050 product is a rowing machine that provides users with a full body low impact workout. It can be used for both advanced or intermediate users. The model consists of quality materials that can stand up to continuous use. This rower integrates lightweight corrosion-resistant aluminum with ultra-durable steel. As a result, it’s both sturdy and easy to move and store. A steel frame helps keep the machine anchored and able to support the constant use of heavier users as well. It holds up to 250 lbs and measures 23.5 x 21 x 46 inches. The machine’s full range motion rowing is designed to mimic the feeling of rowing a boat on the water. It has a multi-functional electronic monitor so that you can track your progress and stay motivated. Moreover, you can adjust the training intensity as you wish so that you can get the resistance you desire.What keeps motion smooth and customizable is a hydraulic cylinder . The padded seat and hand grips make the machine comfortable and easy to use. All in all, this is a great workout machine for anyone looking to improve or maintain their overall health. Ideal for cardio and muscle building, it can be used almost every day. 20 minutes total on this machine are enough to get you going. While short, such a session can help build muscles, increase your endurance, help strengthen your heart, and burn plenty of calories. We recommend starting with a 3-minute warm-up ranging from 16-18 strokes per minute. Afterward, start rowing from 3-6 minutes at 20-26 strokes per minute. Allow yourself a brief interlude of 3-6 minutes with slower rowing similar to your warmup. Finish strong for the remaining time with a 24-28 stroke per minute sprint. Don’t forget to also include a much needed cool down to get your muscles to relax after a high intensity session. Cool off for 3 additional minutes with a slow pace of 10-15 strokes per minute. Remember not to push too hard and track your progress slowly increasing your stroke per minute speed. After reaching your maximum speed, you can begin increasing the resistance of the glider slowly over time. This machine is pretty easy to maintain. Cleaning requires a simple handle and seat wipedown, and disassembly shouldn’t be necessary. The ball bearing roller system may need to be oiled every six months or so, depending on how frequently you use the machine. The batteries in the fitness tracking monitor may need to be replaced from time to time. This glider comes with a 1-year frame warranty and an additional ninety-day parts warranty. The Stamina Body Trac Glider comes with a contoured seat cover and padded handles. You may wish to purchase an additional seat cover if you want more padding. Other than that, this rower has pretty much everything you’ll need. Every machine has advantages and drawbacks. Below, we will take a look at a few of these to help give you an idea of what you may like or dislike. Lightweight – It’s easy to fold, move, and store making it great for your home gym. Durable – Designed for daily continued use and will stand up to wear and tear well. Adjustable – Set rowing resistance to your exact specifications. Fitness monitor – Ideal for tracking your progress and staying motivated. Comfortable – Handles padded for comfort and the seat has a contoured design. Warranty – Warranty of up to one year comes in handy and gives you peace of mind. Multi-functional design – Can be used for working many different body parts with many speeds and routines so that you get the most out of the machine. The piston may squeak – Some users have reported the piston squeaking after a while. Foot straps are awkward – The foot straps aren’t designed for the shapes of the feet of some users. Difficult to assemble without instructions – Though assembly is easier than many machines in the category, you will definitely need to hang on to your instruction manual. Don’t think you can just wing it. This machine is difficult to assemble without the directions. Due to its popularity, there are many user reviews pertaining to this machine. Generally, reviews are positive. Below, we have included summaries of the most helpful consumer and user notes. 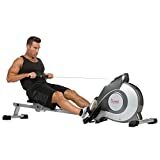 In conclusion, this rower seems to be a great option for the price. It has lots of little bonus features and is comfortable and durable. Certain aspects, like the foot strap slippage and the squeaking, aren’t ideal. Still, overall, it appears to be a great low-impact workout option for your home gym. 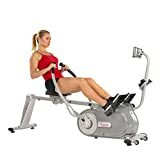 This rower would be a smart choice for users who want to get in a daily workout routine from home without investing too much money or risk in overly expensive equipment.